Whether you are staying in Mumbai or Newyork, travelling through road becomes one of your worst nightmares as you will find your vehicle hardly moving in that awful traffic jam. Life would have been so easy if you could generate traffic so easily on your website as well but as they say what comes easy won’t last, so if you want your numbers to stay and grow, work harder. And to help you in your hard work, last time we told you about some ways to increase referral traffic and today, we bring to you some amazing ways that will increase the organic traffic on your website. If you want the results that you have not received before, you need to create something that people have not seen before. Try to predict what people will search in the future and create your content accordingly. This will help you to rank higher and you will face relatively less or no competition. “Content is the King”I am sure that you are hearing this for the millionth time but you can’t deny the fact. If your content is not good enough, people will have no reason to visit your website. 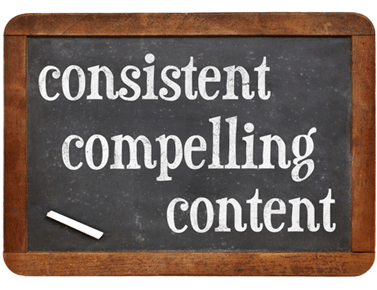 Along with good content, make sure to be consistent as well. Be consistent in posting your blogs on your website. 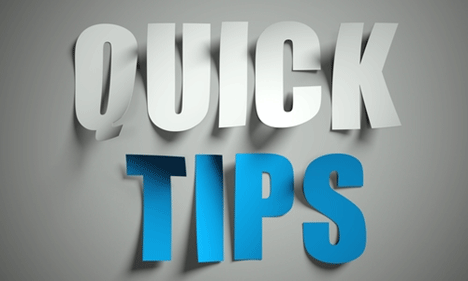 If you act lazy in posting blogs then your audience will find another source for information. Don’t keep your audience waiting. Out of sight is out of mind and this statement holds true in case of Digital Marketing. Stay in sight of your audience by creating consistent content that makes a difference. The most important factor that not only affects your organic traffic but also your overall traffic is the quality of your website. Slow and Steady wins the race but not this one. If your site takes forever to open then even if you have great content, you will lose out on traffic. 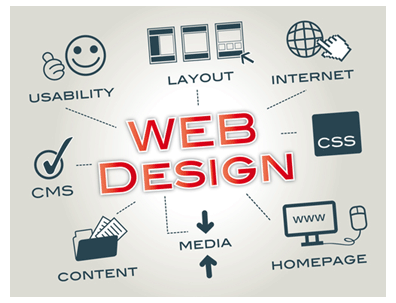 So, make sure that your website is updated with all the latest algorithms by Google. Like recently, Google introduced Mobilegeddon where Google started ranking mobile sites better. The algorithm now gives preference to websites which are mobile responsive and load quicker on mobiles. Note: This change did not affect the rankings on desktop results. Jacob Lumby, owner of Cash Cow Couple advises to use a good SEO plugin. He says, “Get a good basic SEO plugin, configure it, and learn how to use it. 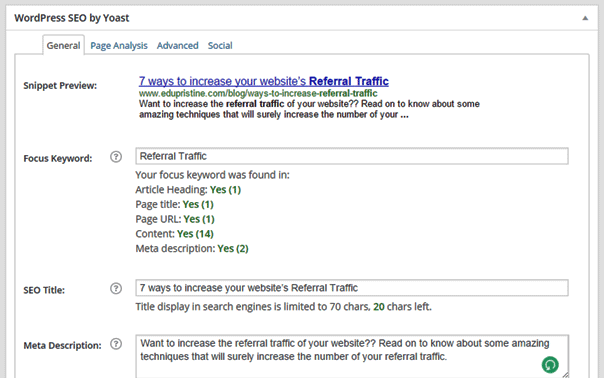 Yoast all in one SEO is a great free option, and the one that we use. This plugin allows you to customize titles, permalinks, schema markups, and a ton of other useful SEO tricks. A good SEO plugin will ease your SEO efforts and bring to you the good results. The SEO plugins helps in extending the functionality of SEO. The longer or the more specific your keyword the less competition you will face so make sure that you use long tail keywords in your content. 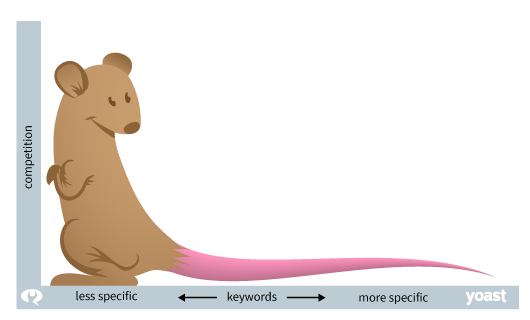 According to a study, long tail keywords help to increase the rankings as well as the conversions. You can use various tools to carry out the long tail keyword search like UberSuggest wherein you can just input the head word and it will give out various long tail keyword searches for that term. Other tool that you can use is Keywordtool.io . Similar to UberSuggest, this tool will give you various searches for a particular keyword for free and if you subscribe to the Keywords Tool Pro then you can also see Search Volume, CPC and competition just like Google Adwords. Neil Patel mentioned in one of his blogs that by using the long tail keywords his organic traffic increased to 173336 visitors per month. So don’t wait more and start using the long tail keywords now. Create amazing content that your customers or target audience will want to share or link to. It’s worth investing in a great copywriter! Ensure all of your company addresses are registered and up to date on Google My Business . This will help you show up in Google map results! Sign up to the Google Search Console. Within this you are alerted if Google picks up an error on your site, review the keywords your customers are searching to find your website and submit your site to be indexed to Google. Check how your website displays on mobile and tablet devices with the Google Mobile-Friendly Test Tool. If Google does not see your site as mobile friendly then this tool will give you a list of recommendations you can fix. And lastly.. Don’t ever, ever buy links! This will get you on Google’s naughty list! 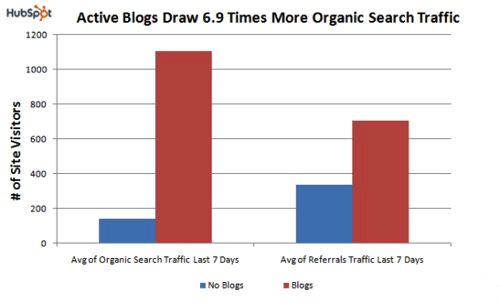 If you are using some other way that is getting you a lot of organic traffic, do share it with us.